The Chinese maker of video cards Zotac has presented its first solid-state drive that relies on a PCI-E 3.0 x4 interface. The new device is called Zotac Sonix and targets gamers and hardware enthusiasts. The Sonix comes with a capacity of 480 GB and uses MLC NAND flash memory, made by Toshiba. The SSD has a buffer of 512 MB DDR3 memory and all this hardware gets driven by a Phison E7 memory controller. Thanks to the high-speed interface, the Zotac Sonix reaches some impressive read and write speeds of 2600 MB/sec and 1300 MB/sec, respectively. The SSD has also been designed in such a way so that it can be used in mini-ITX systems as well. 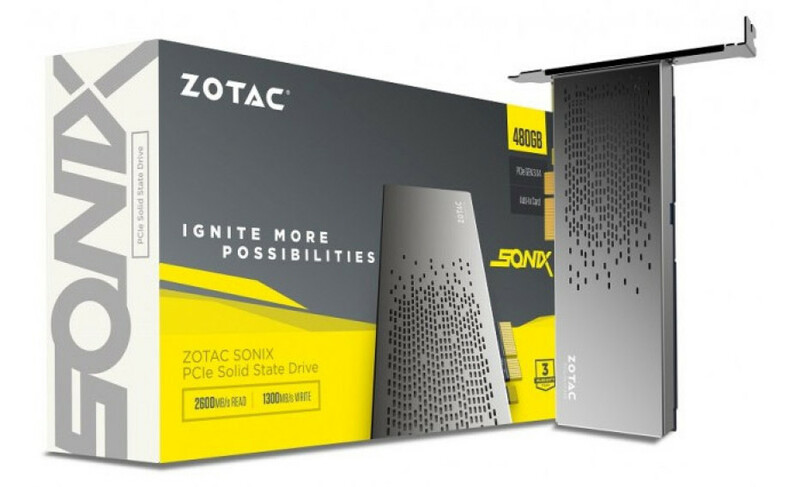 The launch date and the price of the Zotac Sonix still remain a mystery but the device is definitely worth a look.